With the tag line “A Gin Like No Other,” how could I refuse a cocktail kit from Brockmans Gin, a new-ish gin out of the U.K.? Sign me up! Brockmans uses an interesting mix of botanicals, including almonds, berries and cassia bark (not dissimilar to cinnamon). What’s more, the gin came with tonic, so I really had no excuse not to pour myself a G&T. A cocktail kit with tonic included. Nice! But first, I sampled the Brockmans on its own. Though I found it a tad fruity and floral for my taste, I appreciate what they are doing with this gin. Dried and wild blueberries and blackberries add sweet berry notes that compete for prominence with the more bitter, piney juniper berries. It’s smooth overall, but it may taste foreign to gin drinkers accustomed to a drier, more herbaceous style of gin. 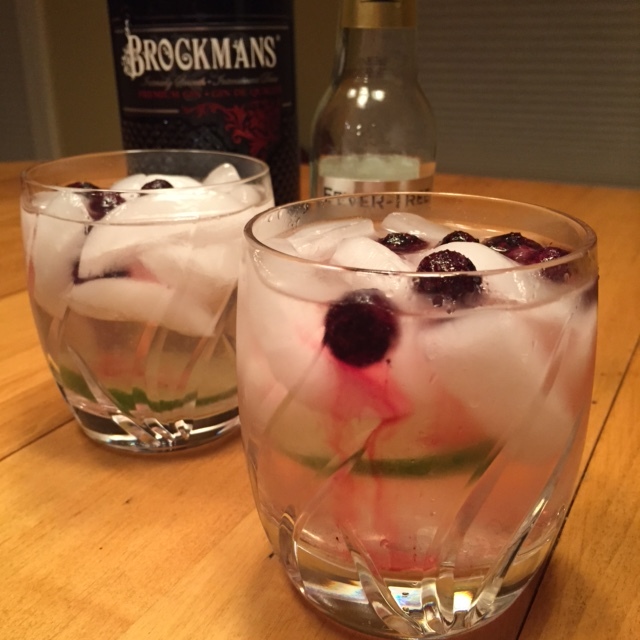 What Brockmans will gain are new gin drinkers whose palates veer to sweet, and those looking for a break from tradition. The cocktail kit came with a wee bottle of Fever Tree tonic, a lovely, citrusy tonic, also from the U.K. Other Brockmans botanicals include lemon peel and orange peel, so it was well-matched with the Fever Tree. In lieu of the recommended twist of pink grapefruit peel (see recipe), I squeezed in a bit of lime. Then I dropped in some frozen blueberries, which bled pink into the drink and made it look very pretty. But how did it taste? Good, if fruitier than I’m used to, though its berry taste made me pine for a summer patio rather than a dark Novembver living room. And in hindsight, the grapefruit would have been better than lime. Next time! 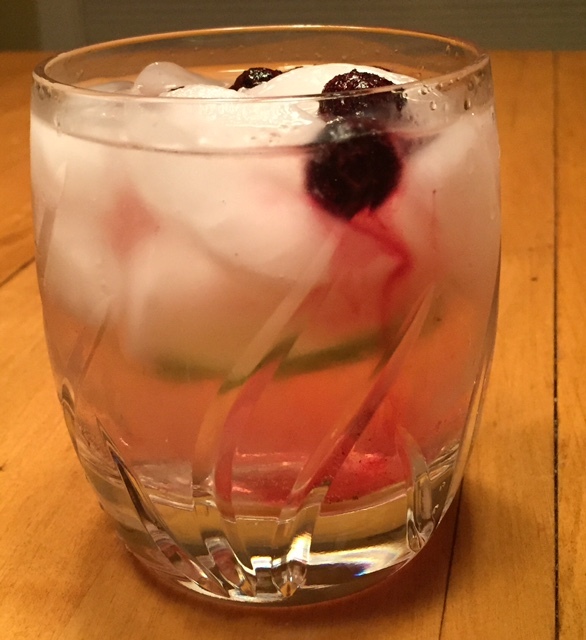 Blueberries make a sweet and pretty garnish in this fruit-forward G&T. Method: Build the drink in a rocks glass filled with ice, stir. Garnish with a pink grapefruit twist and blueberries. This entry was posted in Cocktails and tagged Brockmans gin, gin and tonic. Bookmark the permalink.